Unused goods may be returned. A minimun 15% restocking fee will be applied to all returns. No returns or refund without RMA number. No returns after 60 days. Anyone returning items needs to have a RMA number issued by us. Please call our customer service department to get your RMA number. Lefthander Chassis, and related entitles, make no written, oral, expressed or implied statement or warranty or guarantee on any product sold. In particular, Lefthander Chassis excludes all implied warranties of merchantability and fitness for a particular purpose. The purchaser, and its successor and assigns, assume all responsibilities for malfunction, damage after installation. 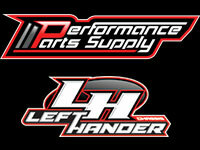 Lefthander Chassic products are not approved or intented for street or highway use. Purchase and/or use of Lefthander Chassis products implies recognition and exceptance of this entire warranty and disclaimer by consumer.